Have you heard? Lollishops has opened for business! The site is still having a few hiccups, but I think that it will all be worked out soon. I've been looking at all of the beautiful creations and shops. I've already found a few things I want to buy. I've been working on more pincushions in a foofier style. I listed some on Etsy and two in my Lollishop. I photograph my pincushions on the pages of vintage women's magazines. I like the patina of the old paper and the vintage graphics. I thought you might like a closer look at this Modern Priscilla magazine. Published in June of 1910 and ten cents. 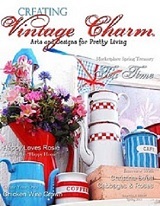 It is filled with stories about homemaking, crochet, even exercises. Of course they all had to be embroidered with decorative designs or monograms. Can you imagine? I would have been an old, old, maid before I filled my hope chest. There's an article on corset devices and a full page ad for Royal Worchester Corsets that beautify every figure! Looks like torture to me! I love this crocheted opera bag pattern. I had to laugh at an article called The Woman with Ugly Shoulders. Your shoulders should be soft and as satiny as a rose leaf. Included is a recipe for massage cream: OIl of sweet almonds 20 grams, lanolin 30 grams and one half gram of Tannin. If your shoulders are pudgy and full of great soft creases, you can reduce them by giving them a heavy dry massage every day. I'm booking myself a full body massage if that's all it takes to get rid of the pudgys! Welcome to another Pink Saturday! I've gathered some of my vintage pink ornaments to share. I love this hot pink ball with the Hello and the cute little snowlady in an apron. This frosted indent is my favorite though and it is carefully put away every year. I don't know where this pink beaded ornament came from. I like to imagine it was made by a little white haired lady. I'm posting tonight because tomorrow I plan on getting my home decorated for Christmas. I've been teasing my boys about a pink Christmas for the last month, but, it looks like I'll have to find some more pink ornaments first. I like to support the artists on Etsy. This is my latest purchase. It's not vintage but it is so pretty. A vintage inspired cupcake ornament from Jenny at Everyday is a Holiday. I put vintage+Christmas+ornament+pink in the Etsy search box and look at this whole page of pretty ornaments! Have a wonderful holiday weekend. Make sure to go visit Beverly and take a peek at all of the other Pink Saturday participants! The fabulous Phyllis from Shabby in the City is having a Portable Studio-Craft Destination Challenge. I was going to take my portable studio to some exotic destination like Fiji or something, but, Thanksgiving is two days away. I have 15 people coming for dinner and a house that barely fits five of us. So, I've been cleaning and putting stuff away. My portable craft studio is a vintage travel case. I keep all of my pincushion making supplies in it and I can carry it out to the patio swing when the weather is nice. I have to tell you about the travel case. My son-in-law was getting rid of a few things when they were moving. He thought my son might be able to use the case for transporting guitar cords and microphones. Well, I snagged it for myself. I painted it pink and added some hand painted smudgy roses and polka dots. The other day when we were getting ready for a craft fair, my daughter and I were looking for the cash box and couldn't find it. My son-in-law asked where the travel case was, mentioning that it would be a perfect to use for the craft show. It was sitting right behind him...all pink and full of my "stuff". My daughter and I just looked at each other and neither one of us said a word. I pried my boys away from their computers and musical instruments long enough to draw a name for the Christmas Fair drawing. Stephanie of Lulu's Cottage was my winner. It really does say Stephanie on that paper. Something is wrong with my printer and it is smudging everything. You gave me some great ideas for stocking stuffers. If you look in the background of my pictures, you'll see lots of musical instruments, so guitar strings and picks will be on my list. As well as puzzles, candy and gift cards. We like to give one main gift and then fill the stockings with fun things. I have been known to buy stocking stuffers and forget where I put them. Somewhere in my house there are sterling silver frog prince barrettes for my daughter. I don't think she has worn barrettes in years, but, I haven't forgotten how I was so excited to buy them and couldn't find them at Christmas. Yesterday, I showed the goodies that I received from Nancy for the Pink Vintage Christmas swap. Tonight, I'm showing a few of the things I sent Nancy. I mailed my swap gift to Nancy in Texas on Thursday and she let me know that she had received it on Saturday. Now, that is quick! I had fun putting her gift together. I made her a small sachet pincushion and did a little something different with it by adding a vintage button and a few forget-me-nots. I also sent her some of those Martha Stewart Christmas ornaments, a few vintage ornaments and a little vintage angel. The angel is one of five I found at an estate sale. I sent an identical one to Kim at Ragged Roses in my very first giveaway. There's still two more that need new homes some day. Welcome to another Pink Saturday. I thought I would show you the package that arrived from Nancy at My Crafty Little Page. We were partners in the Vintage Pink Christmas Swap. Nancy sent me the most wonderful package full of lots of pink vintage and handmade goodies. Among the treasures were the cutest Precious Moments ornaments and an adorable vintage pink baby shoe. She's also a talented artist and she made up cute tussie mussies, and the cutest little spool with button flowers. Look at this pretty pink bird. I'm showing just a tiny little tease of what I sent Nancy. For more pink than a room full of little ballerinas head on over to Beverly's and you'll find lots more pink posts to read about. Karen at Scrapbook of Inspiration is hosting tomorrow's online Christmas Craft Fair. She has beautiful cards and yummy desserts to share. I've been doing Christmas boutiques for over 20 years. When my kids were younger, we hosted a boutique called Elf's Landing every year. We would clear out our garage and turn it into Santa's workshop. I had the sweetest senior citizen friends named Betty and Bob that did woodworking and made lots of primitive country shelves and toys. Our shop would be filled with everything from "bug catchers" to teddy bears. We never made a lot of money, but, it was always so much fun. We've talked about bringing back Elf's Landing and some day we will. Nowadays, my daughter has joined me doing boutiques. She makes the yummiest fudge and crochets the prettiest dish and spa cloths. Go here to see her easy and yummy fudge recipe. I like to pick up stocking stuffers at Christmas fairs. You can find things like snowman poop and reindeer droppings (marhsmallows and chocolate covered raisins). I'm always looking for stocking stuffer ideas. I'd love to hear what Santa puts in yours. I need stocking stuffer ideas for the "men" in my life (ages 16, 24, 32 and 56). Leave me a comment with your best ideas and I'll have one of my guys draw a name from the comments on Sunday night. You can choose a pincushion or a cupcake in your favorite colors and I'll make one just for you. I'm making lots of stocking stuffers in my shop. Pincushions for your favorite seamstress, tissue holders and crocheted cupcakes for your little girl's tea party or for your big girl's sewing table. Yes, it's shameless self-promotion but how else will I buy more stocking stuffers?! Some days I want to paint all my furniture white and slipcover everything with pastel prints. And then I see a little vignette like this and I remember that I am really just a "country girl" at heart. I love that little green chair with the blue doily. Do you have a Farmer Boys restaurant in your town? This is just one of the little vignettes around the restaurant. I had a yummy cobb salad and enjoyed lunch out with my hubby who is feeling much better. My youngest son is finally back at school. My oldest son is back at work. Life is good. On my last post, I mentioned that I needed a vacation. My sons have a cold virus. My hubby pulled his back out. My mother is just my mother. Some of you gave me some great suggestions. Jennie mentioned retail therapy. I'm sure Jennie was thinking big malls and clothing stores. I went the cheap route and with my daughter as my accomplice, we did a little budget conscious shopping. Look at these adorable ornaments from Martha Stewart's collection at KMart. I love that pink sugarplum! We also went to WalMart and I bought some more pink yarn for the granny square blanket I'm working on. Hiding in your bedroom and crocheting is also great therapy. I have ten squares done and 115 to go. I figure that will get me through the cold and flu season. Linda mentioned getting some Calgon therapy. Do you remember the Calgon commercial? I need some Calgon bubble bath and some of my daughter's pretty pink spa cloths and I will be saying, "Calgon-take me away!". If you're in need of pink therapy or even if you're not...head on over to sweet Beverly's and visit all of the other pink posts today. Do you remember playing with dolls? Sharing secrets with your best friend? Bathing the teddy bears and kissing the boy next door? Do you remember wishing that you were grown up?